We left Burgos at 5 am in order to experience the Campostella, that is, the field of stars. We were disappointed because the urban lights hid the splendor of the starry night from our eyes. However the morning we left the little village of hontanos we were not disappointed. The starry night blanketed itself over us. The stars were so radiant and beautiful that one’s spirit soared. As the morning began to dawn the light of the stars began to diminish until only the morning star was shining brightly in the sky. My thoughts turned to the exultet of the great Easter vigil: may Christ that Morning Star who came back from the dead find this light still burning. 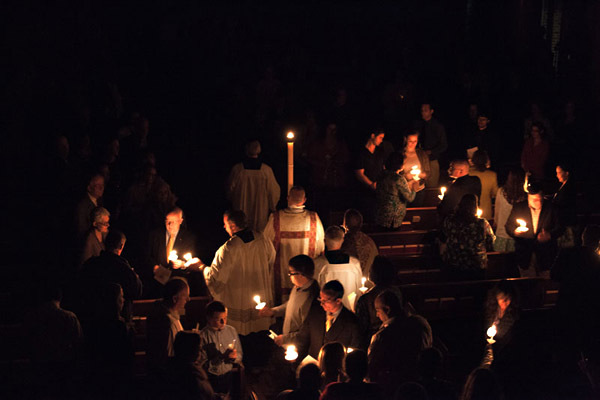 The starry night of the Campostella evoked within my heart the beauty of the Easter Vigil at Saint Benedict. This entry was posted in Beauty, Camino, Easter, Pilgrimage and tagged Camino, Christ, Compostella, Easter, Pilgrimage, starry night, Vigil on September 11, 2014 by frjfkauffmann.